FIGURE 1. 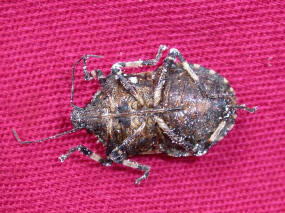 Rough Stink Bugs are very well-camouflaged and closely resembles the color and texture of tree bark on which it lives. You�re not likely to notice them unless you know what you�re looking for�and paying very close attention! FIGURE 2. A closer view of the Rough Stink Bug. Four of the six trees along a parking lot each had a solitary Rough Stink Bug on the trunk. This photo was taken in late December 2006. FIGURE 3. The Rough Stink Bug has an elongated head with antennae located far in front of their compound eyes. FIGURE 4. The underside of a Rough Stink Bug reveals the "business end" of this insect predator. The Rough Stink Bug tabs its prey with its piercing and sucking mouthpart. A toxin is injected which immobilizes the prey and starts the digestion process. Overall populations are low but occur throughout Galveston-Houston area. Usual habitat is on trunks of broadleaf trees such as ash, oak, etc. Typically solitary. Phew! What�s that smell? Nothing serious, just a Brochymena arborea, otherwise known as the Rough Stink Bug. 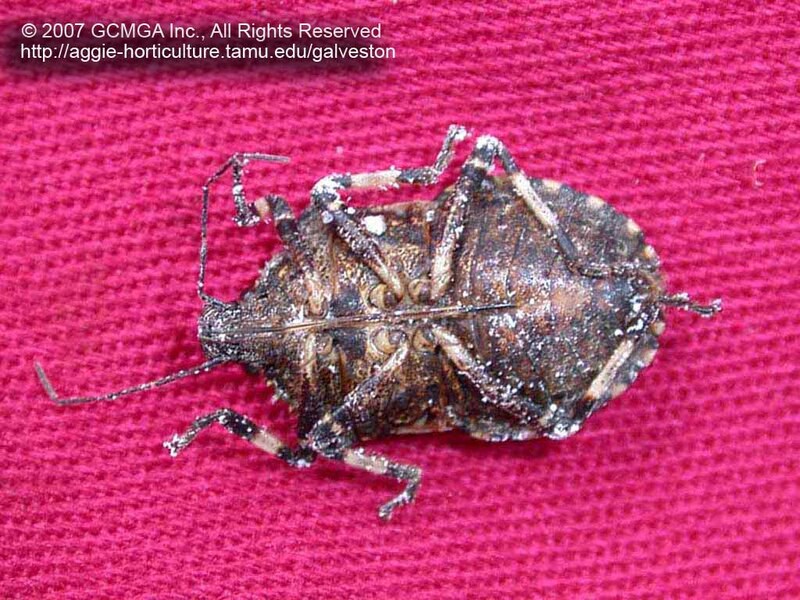 Rough Stink Bugs are not harmful as these beneficial predators prey on caterpillars, plant eating larvae of beetles, adult beetles, aphids and other soft-bodied insects with their piercing and sucking mouthparts. 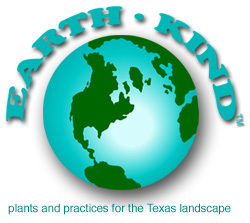 As there are 2,000 species of stink bugs in the world, with over 225 in North America, you are bound to come across a few in Galveston County. You will find them on landscape trees and fruit trees in home landscape. The Rough Stink Bug is a member of the Pentatomidae family. The Rough Stink Bug is capable of producing teeming amounts of foul-smelling fluid it discharges when disturbed. Both adults and nymphs possess large stink glands on their undersurface, which open through conspicuous slits. 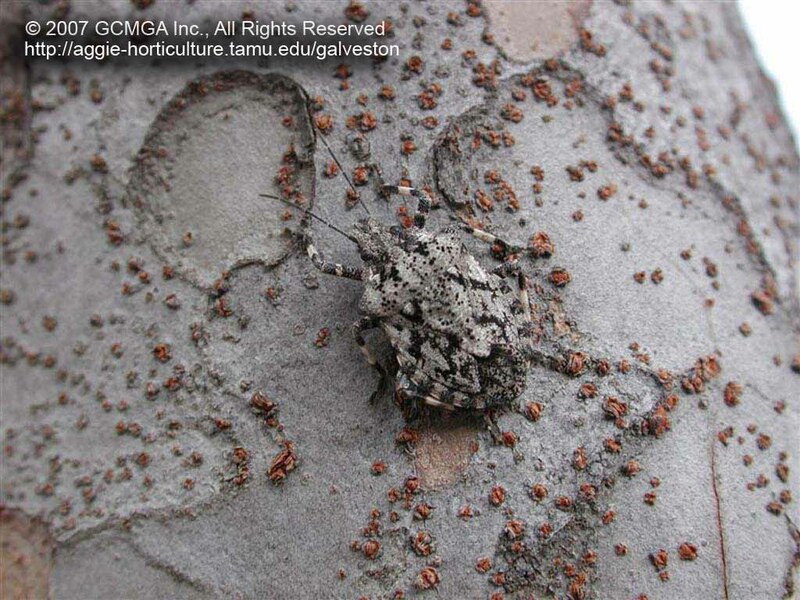 Rough Stink Bugs are very well-camouflaged and closely resemble the color and texture of tree bark on which it lives. You�re not likely to notice them unless you know what you�re looking for�and paying very close attention! When you first notice them, you might think that they are an insect pest! The adult stage is about � inch long. The Rough Stink Bug has an elongated head with antennae located far in front of their compound eyes. Generally, beneficial species of stink bugs are distinctive from their plant feeding counterparts. Aside from their color and rough-textured appearance, predatory Rough Stink Bugs have spines projecting from the corners of their thorax, whereas plant feeders have rounded "shoulders." They also have short, thick beaks while plant feeders have long, slender mouthparts. The adult female lays small masses (resembling honeycombs) of eggs on the leaf surface of twigs in the spring. The eggs are pearly white, barrel-shaped and armed with spines. Rough Stink Bug nymphs grow slowly into adults that overwinter in mulch, cracks, crevices or under leaf litter. There is only one generation per year of Rough Stink Bugs. Remember these are beneficial insects that control caterpillars and other insect pests. Before randomly destroying an insect, always attempt to identify it first (or at least determine whether it�s a beneficial or pest). No one wants to kill a good critter.